I was soon on the road and heading south. South-western Oregon was geographically similar to north-eastern California, with the rolling hills and seemingly pastures. Although the sites were nothing to thumb your nose at they weren’t nearly as awe-inspring as the mountains I’d driven through the day before. 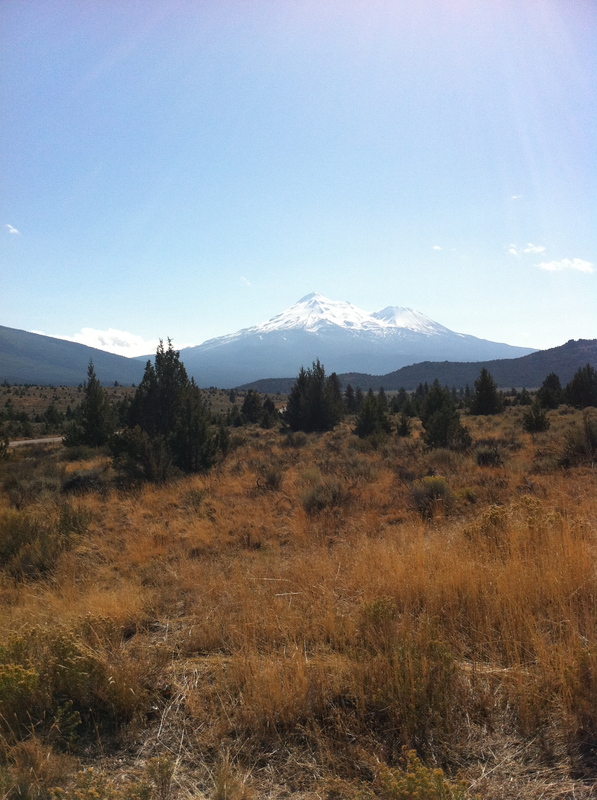 After a quick stop at the Oregon/California border (where I had to inform them whether or not I was brining any fruit into the state) I found myself back at Mount Shasta. The view from this side of the mountain was much better and I had to pull over to take a few pictures of this beautiful peak. On the road again, I cruised through the pine laden Lake Shasta and was making good time, so I figured it wouldn’t hurt to make a little detour. Russian River Brewing was not too far away from where I was and they do make some damn fine beer. With a few quick searches on my phone, I had the directions and headed toward Santa Rosa. Other than the fact that I was almost ran off the road by a man in very large pickup (who wasn’t paying attention), I rather enjoyed the drive to Russian River. The hay-covered hills lead into a valley that pinballed my car back and forth down a hairpin turn filled, tree covered road, before spitting me out on the other side of Santa Rosa. After a quick drive across town, I found myself at Russian River and just in time for dinner! Even though the place was pretty full they were able to sit me with minimal wait. I ordered some Pizza Bites and a TEMPTATION sour ale. Temptation is part of their barrel-aged series, but not one of the more readily available beers. I didn’t hate the beer, but I think the wine flavors imparted by the barrel really over-shadowed any of the sourness created by the wild yeasts. I didn’t dislike the beer, but it didn’t floor me like I had hoped. With the next round I decided to go a little more “traditional” with my beer selection and I ordered a HAPPY HOPS (to go along with my Abbey pizza). I have to say that Happy Hops was one of the better beers I had ever had from Russian River (and that’s saying a lot). It was sweet, but sticky; hoppy, but mellow. This beer set my mind at ease and made me quite happy that I had went out of my way to stop at RR. I still had a long drive ahead of me, so I decided that any more than two beers and I might be pushing my luck. They boxed up my leftover pizza, filled my growler (with DON THE YOUNGER), brought me a bottle of their Framboise for a Cure (review coming later) and I was on my way. The sun had set and I was looking at seven more hours of driving, but my stomach and mind were satiated. With a smile on my face I headed home.